Here are a Few Frequently Asked Questions about TBBC and our Services. If you have questions, call TBBC toll-free at 1-800-792-8322. About Us: The New Jersey State Library Talking Book and Braille Center (TBBC) is a regional library of the National Library Service for the Blind and Physically Handicapped (NLS), a division of the U.S. Library of Congress. We are affiliated with the New Jersey State Library and with Thomas Edison State University. There is no cost to TBBC’s members for its services. The New Jersey State Library Talking Book & Braille Center is supported with funds from the Institute of Museum and Library Services. Who is eligible for TBBC’s services? Eligible individuals can choose from the following no-cost, home-delivered services: long-term loan of a digital audiobook player, loans of audiobooks on digital cartridges, downloadable audiobooks, audio magazines and Braille, loans of Braille Books, and access to an audio news reading service. All equipment and audiobooks are property of the U.S. Library of Congress. Any unused equipment or audiobooks should be returned to TBBC. Download an application for individuals. Places that Serve Qualifying NJ Residents are Eligible: Any place that “might be expected to include” at any time clients who meet our eligibility criteria can apply for an institutional account. Examples include assisted living centers, continuing care communities, hospitals, nursing homes, rehabilitation centers, schools for the blind. A facility can have audiobook players, audiobooks, Braille books, and a BARD account for downloading audiobooks and magazines. These places can also register individuals for individual accounts. These institutional applications are called deposit accounts, but there is no cost. All equipment and audiobooks are property of the U.S. Library of Congress. Any unused equipment or audiobooks should be returned to TBBC. The institutional deposit account application should be completed, signed, and then faxed, scanned and then emailed, or mailed back to TBBC. Our fax number is 609-406-7181 and our email is tbbc@www.njstatelib.org. Download an application for facilities. Libraries Are Eligible: Libraries may have deposit accounts and can have long-term loans of audiobook players, a collection of audiobooks, and a collection of Braille books to use with patrons. Libraries can also register their patrons for individual accounts. All equipment and audiobooks are property of the U.S. Library of Congress. Any unused equipment or audiobooks should be returned to TBBC. The library deposit account application should be completed, and faxed, scanned and then emailed, or mailed back to TBBC. Our fax number is 609-406-7181 and our email address is tbbc@www.njstatelib.org. Download an application for libraries. How does a person apply for TBBCs services? Step 1: An individual must apply for TBBCs services and have his/her eligibility certified. An application can be downloaded. The application can be faxed or mailed to TBBC (fax number is 609-406-7181). If a person does not have computer access, he/she can call TBBC at 1-800-792-8322 for an application. Step 2: Application must be certified (see second page of the application). Mail it: The last page of the application is a postage-free return label to New Jersey State Library Talking Book and Braille Center, 2300 Stuyvesant Avenue, Trenton NJ 08618. Audiobooks, Audio Magazines and Digital Audiobook Players: TBBC receives digital audiobook cartridges and digital audiobook players from NLS. Registered members of TBBC are entitled to long-term loans of audiobook cartridges and an audiobook player. In addition, TBBC members will be eligible to download audiobooks and audio magazines from the Braille and Audio Reading Download (BARD) web site of NLS. The BARD files can play on the digital talking book machine or on an Android, Apple or Kindle Fire (2nd generation) device through the BARD Mobile app. To find available audiobooks, there are several sources. Talking Book Topics (TBT) is published every two months by NLS, it is mailed to all TBBC members and it lists new audiobooks and audio magazines. TBT is available in large print, on the web, and can be downloaded as an audio magazine from BARD. Patrons can also search TBBC’s online catalog and request books online; they must call TBBC to obtain their username and password. Audio News Reading Service: TBBC members will have access to Newsline, an audio news reading service. Read below for more information. Braille: TBBC has a circulating collection of Braille books. 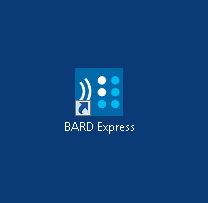 In addition, TBBC members can download web Braille files from the Braille and Audio Reading Download site (BARD). Please note that a person must first be a TBBC member before registering for BARD. Newsline: Access to Newsline, available at no cost to New Jersey residents, is a web-based or telephone-based audio news and magazine service from the National Federation of the Blind (NFB). Patrons need to register separately for Newsline. There are no institutional accounts. Apply by contacting TBBC at 800-792-8322 or NFB-Newsline. Newsline for New Jersey residents is funded by the New Jersey Commission for the Blind and Visually Impaired (NJCBVI). Does a Patron need to Apply for Newsline? Yes. The patron can apply by contacting TBBC at 800-792-8322 or by contacting NFB-Newsline. If the patron has any difficulty with the online application, he/she can call Newsline at 1-866-504-7300. BARD (Braille and Audio Reading Download): Free downloadable digital audiobooks, audio magazines, and Braille files are available from BARD through the National Library Service for the Blind and Physically Handicapped (NLS). A person or facility must first be registered with TBBC and then must apply separately online for BARD. If any person or any facility has difficulty with an online BARD application, he/she can call TBBC toll-free at 1-800-792-8322. Once a person applies for BARD, it will take approximately 3 days for the registration to be completed. Does a person or facility need to apply for BARD? Yes. The services from BARD require a separate online BARD application. Will the BARD audiobooks play on a computer or laptop? No. The files are encrypted by NLS to protect their copyright. The BARD files will only play on the Digital Talking Book Machine (DTBM) or other approved devices. A list of NLS-approved devices is available to registered BARD users. Patrons will have to download software patches for their approved devices. If you have an Android, Apple or Kindle Fire (2nd generation) device, you can use the BARD Mobile app. If anyone has questions, he/she can call TBBC at 800-792-8322. Will the BARD audiobooks, audio magazines and Braille files play on a mobile device? The BARD Mobile app will enable BARD files to play on an Android, Apple or Kindle Fire (2nd generation). Find more info on our BARD Mobile web page. You must be a registered member of TBBC. You must also be registered for a BARD account. You will log into the BARD app with your established BARD username and password. Do the BARD audiobooks expire? No, the BARD audiobooks do not expire. TBBC lends Braille books to its patrons. New Braille books available are listed in the NLS publication, Braille Book Review. It is published in large print, in Braille and it is available on the web. Braille books can also be located in TBBC’s online catalog and can be requested online; the patron will need to contact TBBC for a username and password. Each button on the audiobook player has a Braille label. Each digital audiobook cartridge provides the title in large print and in Braille. Downloadable Braille files are available from the Braille and Audio Reading Download (BARD) web site. You must be registered with TBBC and with BARD. A Braille output device is required in order to read these files. Large-Print books for Children and Young Adults: TBBC has a collection of large print books for K-12 children and for young adults. To request a book, call TBBC at 1-800-792-8322 and ask for children’s services. What is the Digital Talking Book Machine (DTBM)? Individuals, facilities or libraries registered with TBBC will be eligible to receive a long-term loan of a digital talking book machine (DTBM). The DTBM is produced by NLS. An audio-described video demo of the player is on TBBCs YouTube channel . The DTBM plays digital book cartridges provided by TBBC or audiobooks downloaded from BARD to removable devices, such as flash drives. There are two DTBM models: A basic model (DS1) and an advanced model (DA1). Are there accessories for the DTBM? Pillow Speaker – limited to readers who are bedridden. Are there software updates for the DTBM? Yes, it is important to keep the players up-to-date on their software. You can determine which version of software is on your player by pressing the sleep button ten times. The player will read the serial number of the player and then read the software version. Watch for software updates here. I downloaded from BARD multiple books and magazines to a flash drive or to a blank digital cartridge. How do I access them on the DTBM? Plug the flash drive into the USB port that is on the right side of the player next to the port for headphones. It is the rectangular-shaped port. The player will count the number of items on the USB flash drive. To access each item on the flash drive, hold down the large, square, green, Play/Stop button until you hear bookshelf. Then, use the fast forward and rewind buttons to locate each book or magazine. When you finish listening and want to find another item to listen to, you will need to return to the “bookshelf” by holding down the Play/Stop button. Will music play on the DTBM? Yes. MP3 files and RIFF WAV files will play. You must use a separate flash drive that does not contain any BARD files for your MP3 or RIFF WAV files. Step 1: Turn the player on while simultaneously holding down the Tone Up, Rewind and Sleep buttons. Step 2: If there is an error in your player, you will hear the player announce one of the following error messages: Cartridge Error, Assistive Technology Error, Power Error, System Error. Step 3: To erase these errors, hold down the Sleep button for 5 seconds. The player will shut off. Step 4: Try resetting the machine again. This will erase any personal settings you have on the machine. To do this, turn the player off and simultaneously, hold down these buttons: Power, Tone Up, Speed Up, Volume Up. When you hear, “Creating a New Profile, the player is reset. Step 5: If you have followed all of the steps above and the player is still not working, it could be that the battery needs to be replaced. First, make sure that the battery is recharged by plugging the power cord, found on the back of the player, into an outlet. It takes approximately 2 hours for the battery to recharge. If the battery does not recharge, pack up the player and ship it back to TBBC in the original box. We will replace the battery and return the player to you. You can always cal TBBC a 1-800-792-83 with any questions. How do I Recharge the Battery on the DTBM? The DTBM battery will only recharge when the battery charge is very low. With the player on, press the power button again to hear how many hours of battery life you have left on the machine. When you hear 6 hours, recharge the battery. To do this, plug the power cord (found on the back of the machine) into an outlet. It takes approximately 2 hours for the battery to fully recharge. Note that the DTBM battery will not automatically recharge each time you plug the cord into an outlet. It will only recharge when the battery’s charge is very low.